There was a crooked man……. 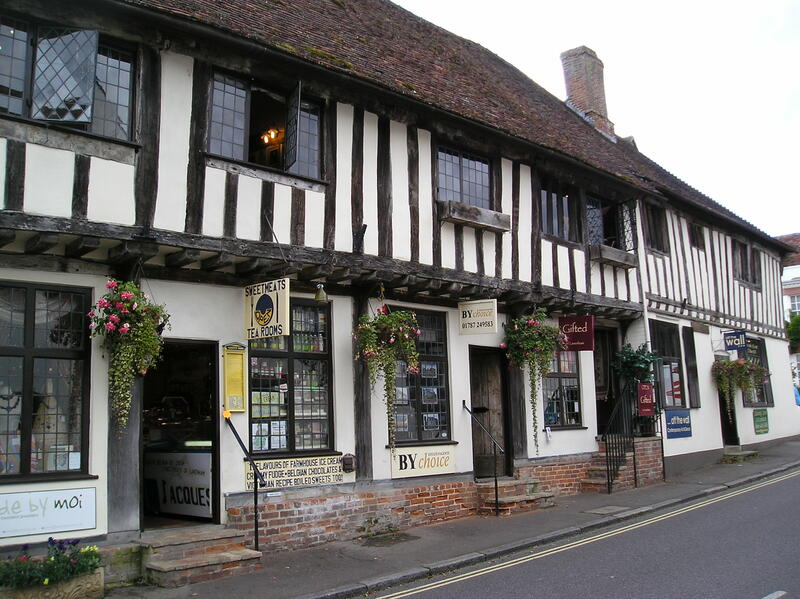 Yesterday, after spending the weekend in Twickenham with my delightful daughter, I made my way up northish, to spend a couple of days with a friend in Hertfordshire; in the market town of Bishop Stortford, a very quaint village with a long history (as do most villages in the UK). We have not seen each other for well over a year now and it was great to catch up on all the news and the chat went on till the witching hour (as you can imagine). 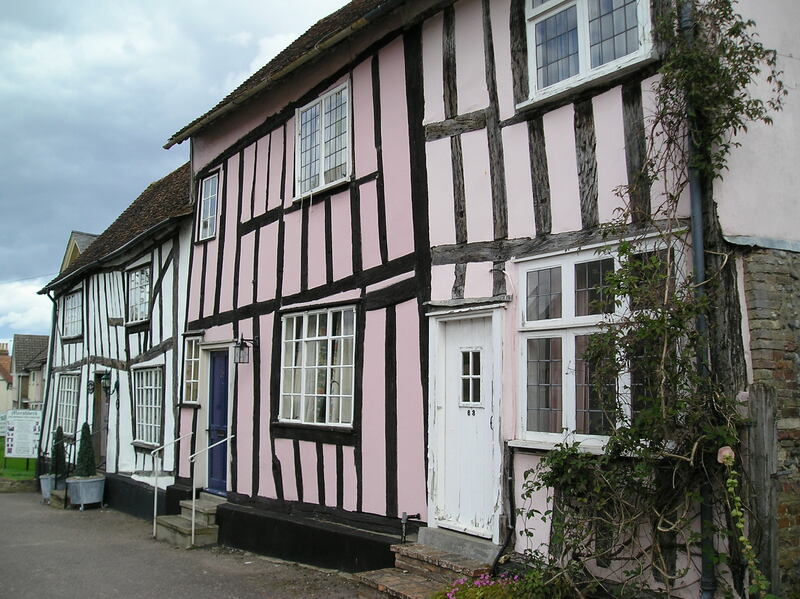 Today dawned bright and early and as a treat she decided to take me on a jaunt through the english countryside to the historic town of Lavenham in Suffolk. 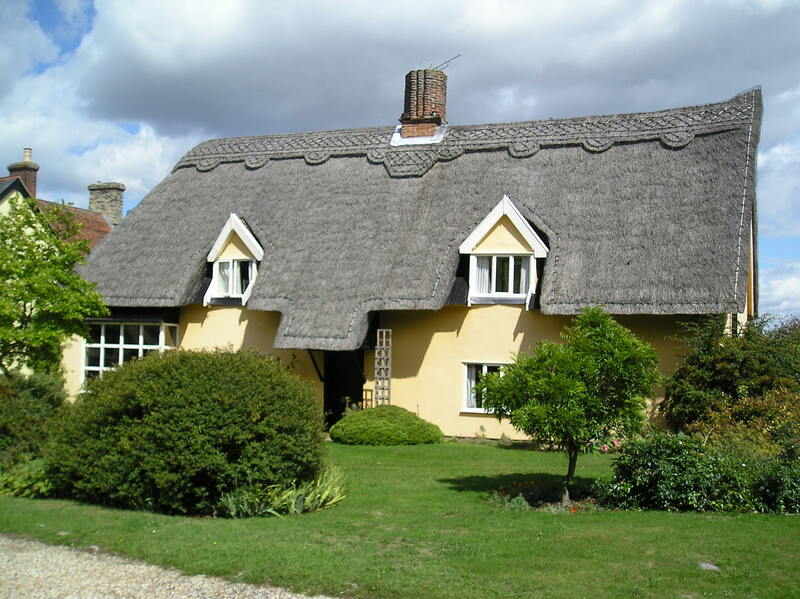 Now, in my opinion having travelled to many of the English counties as well Ireland, Wales and Scotland….Suffolk is the prettiest county in England, and the United Kingdom (you are welcome to disagree 😉 ), so today was an absolute treat driving through countryside that I have not seen since June last year. We set off ‘relatively’ early (we are women after all), and once our destination had been keyed into the tom-tom (I do not trust those things), we made our way north-east. Somewhere along the way, at one of the very confusing round-abouts in this country which need a navigator to get around, we took an exit too soon, and the tom-tom went into a sulk and would not speak to us 🙂 We drove for ages along the M11 (which I realise probably means absolutely nothing to many of my readers 🙂 ) and eventually the ‘lass’ got her sense of humour back and told us to turn left at the next exit. Hooray, we were back on track. So to reach our destination took about an hour longer than it should have. However, I was not complaining, as on the way we drove past fields and fields of grain, rolling hills and scattered copses of lovely green trees. 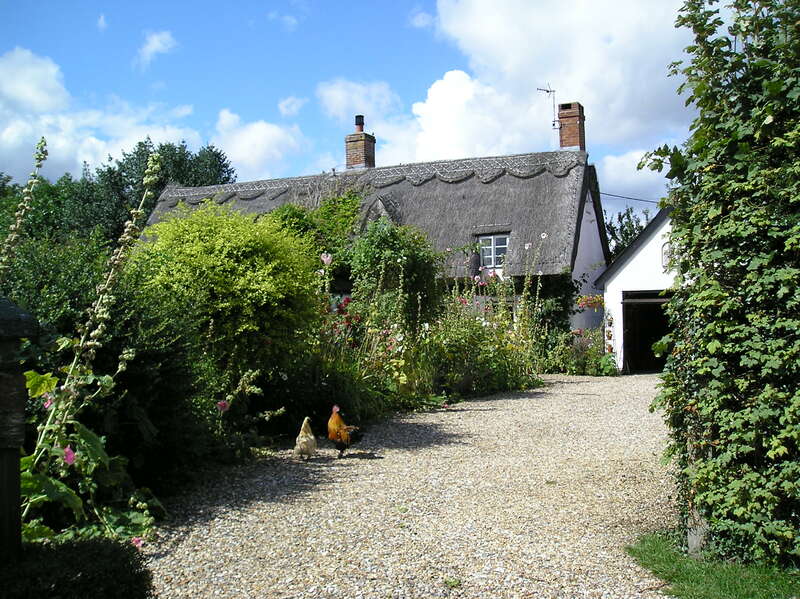 Suffolk, an agricultural county, is mostly flat with soft rolling hills, and today, set against the wonderful blue summer sky filled with broiling, cumulus castles of cloud, made a picture perfect scene. 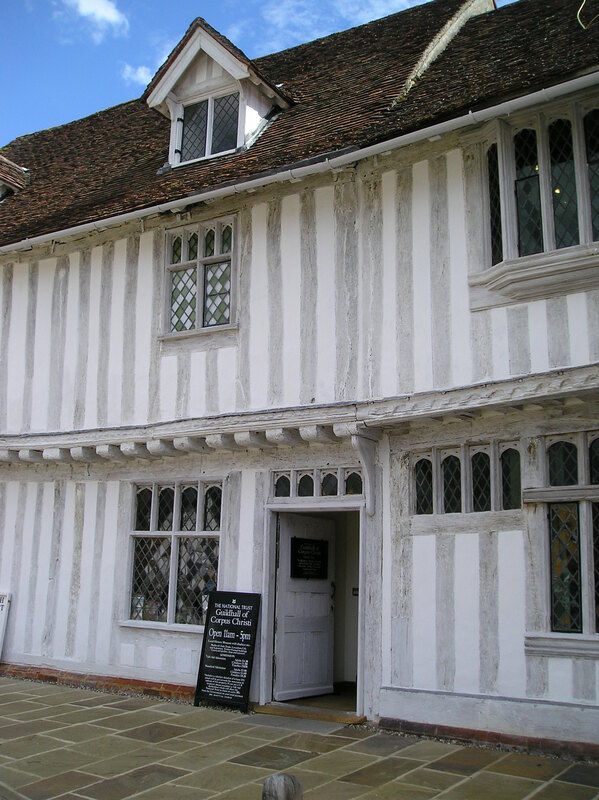 Lavenham, deep in the rolling landscape of Constable’s Suffolk, an historic market town; built on the success of the Wool Trade, is an absolute treasure trove of delightful architecture – some of the cottages dating as far back as 1340 (the Weavers cottage); Britain’s finest example of a Tudor market town. As we drove into the village, on the left hand side and on it’s own little island, we passed the intricately decorative village coat-of-arms. 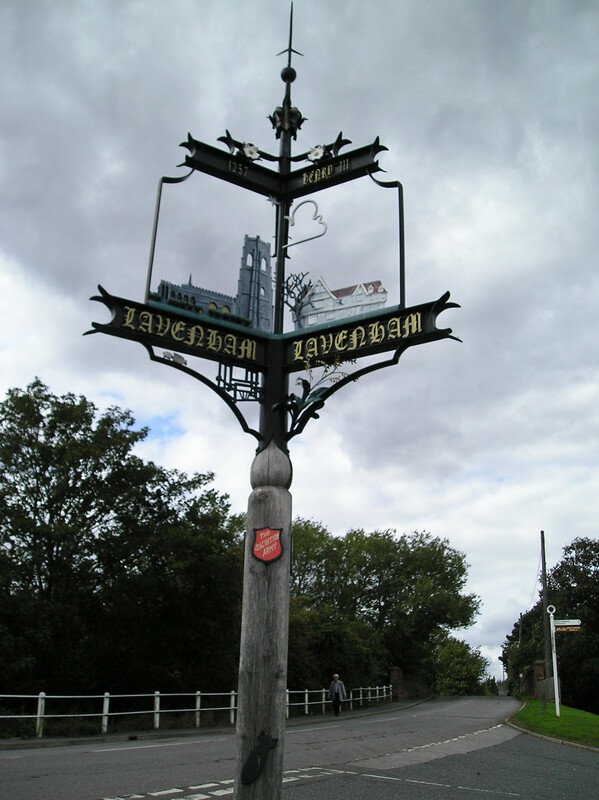 These Suffolk village signboards are an absolute treat, very decorative and give an indication of the trade that established the village. Just about every Suffolk village that I have visited in the past have these delightful coat-of-arms signboards at the edge of town. I was open-mouthed with delight and spent the first 15 minutes or so saying ‘oh my god, oh my god’ these are gorgeous; and gorgeous they were. 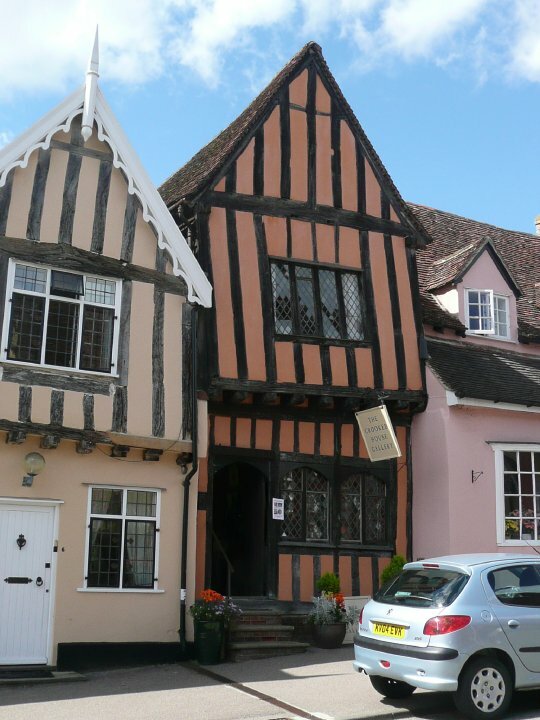 Many of the fine, timber-framed, listed houses in the medieval Tudor style are quite obviously ancient, leaning drunkenly to the side and defying gravity they remain a testament to the style of days gone by. 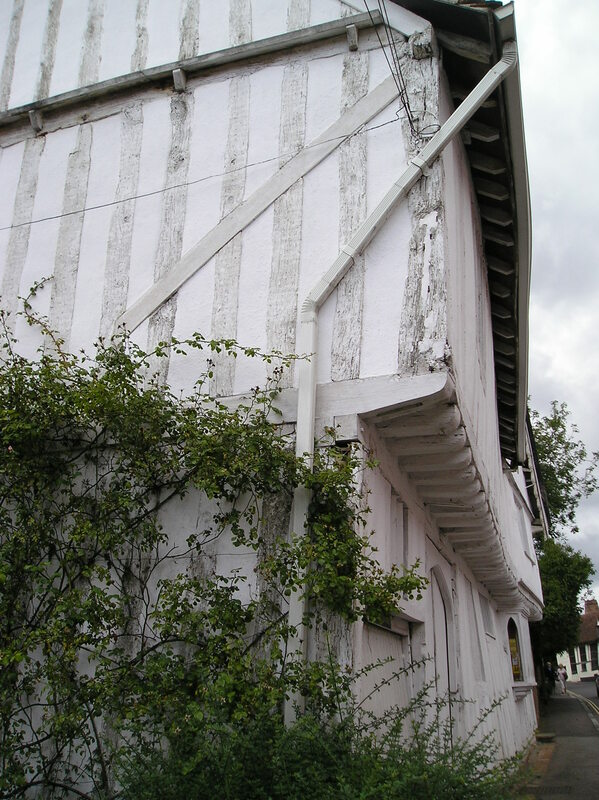 Crooked wooden beams held together by luck and the very ancient plaster filling. The houses are incredibly photogenic, jam-packed one against the other as they were in those days; unbelievable quaint, higgedly piggedly, leaning crookedly and delightfully unruly, painted different colours, their names indicating the trade of the original owners. 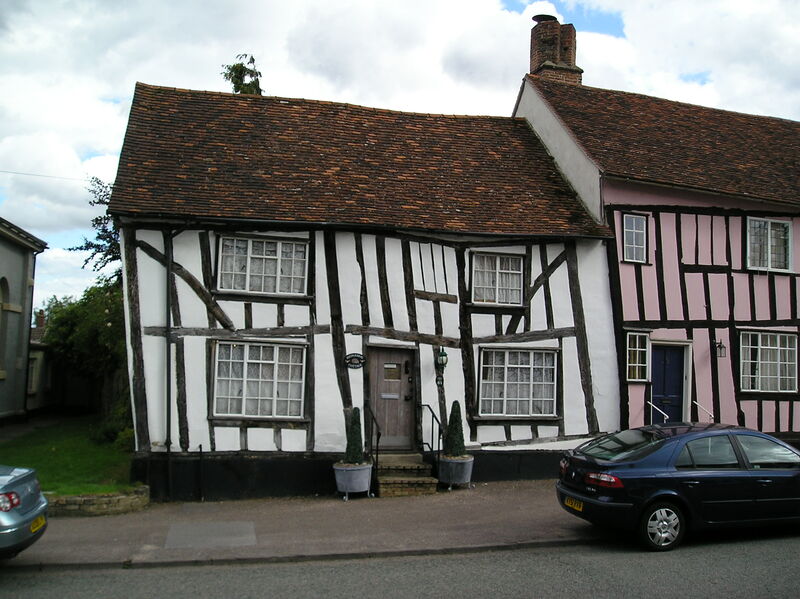 There is even the very quaintly named ‘The Crooked House’ of the nursery rhyme fame. 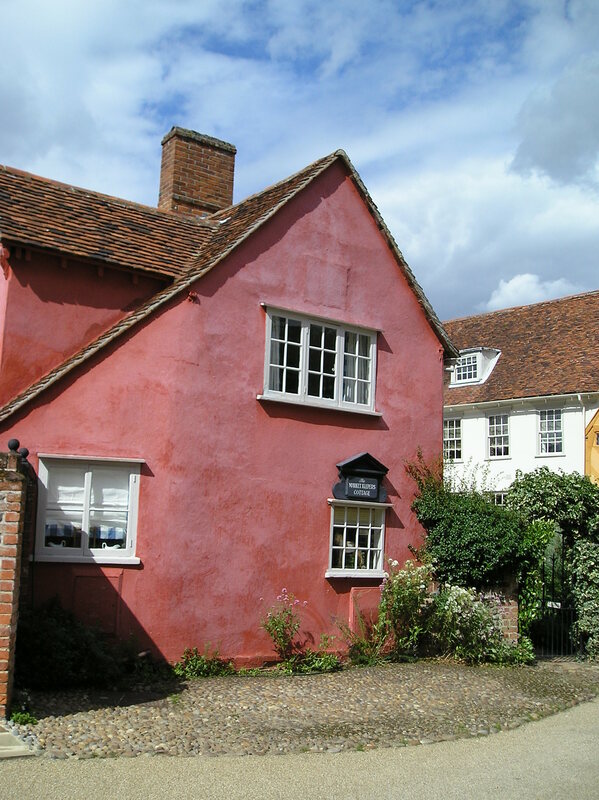 Pink, white, cream and yellow paint give the village a picturesque facade, some of which lead right onto the street, mullioned panes peer out quizzically, creating an air of mystery that makes you want to peek through to discover what lies behind. Doorframes look as if they might just fall right over, and lichen covered roofs lean dangerouly lopsided leaving you feeling as if they could suddenly collapse in on themselves. 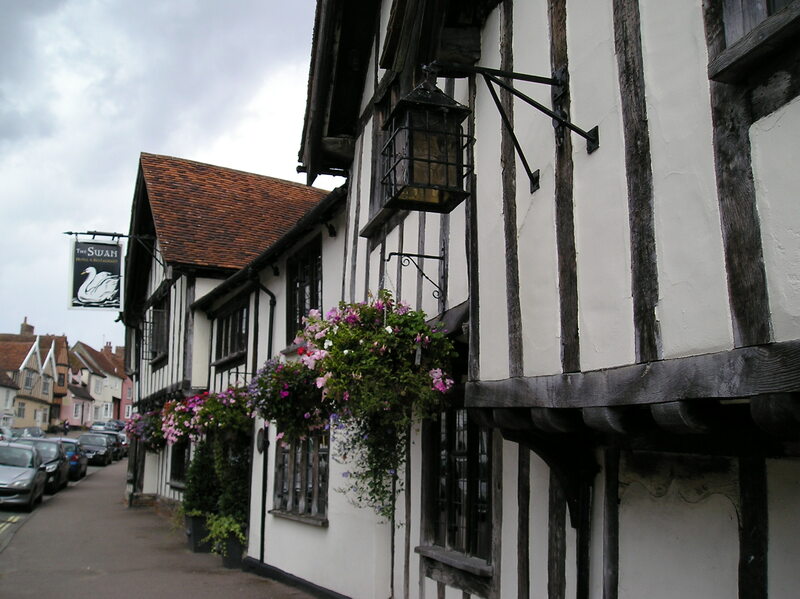 The Swan Hotel, considered to be the ‘jewel’ in Lavenham’s crown, a magnificent rambling, sprawling collection of rooms, has served as a hostelry since before the reign of King Henry VIII. 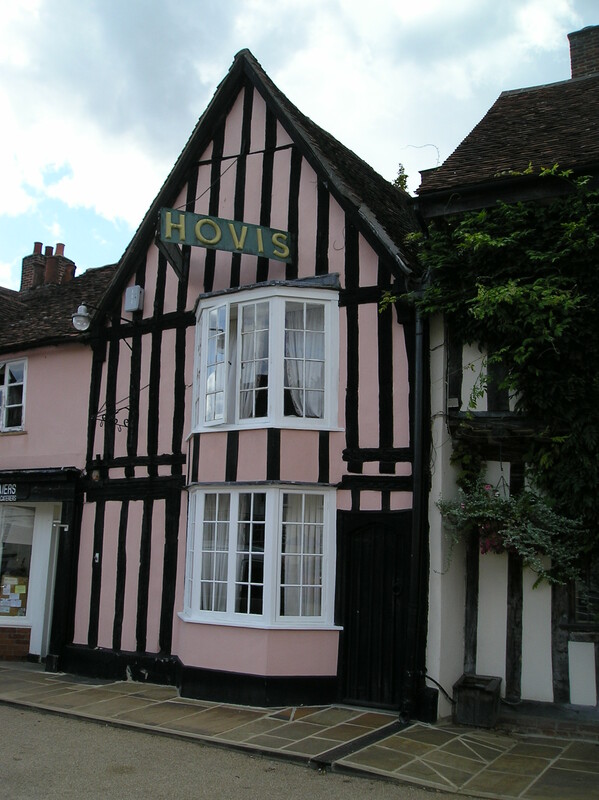 Steeped in history and charm, the interior of the hotel has wonderful, low 15th century wood-beamed ceilings, large cavernous fireplaces, inglenook fireplaces, original Medieval wall paintings, wooden staircases, winding passage-ways that twist one way and then other, with little rooms leading off and creating a rabbit-warren. The rear of the hotel was the original Wool Hall. 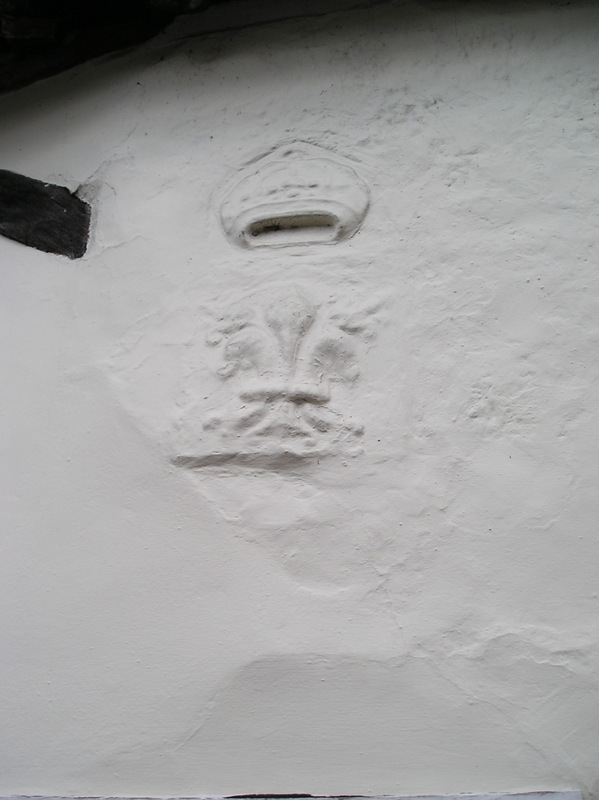 On an exterior side wall we discovered the sign of the Mitre and the triple feather crest of King George IV. 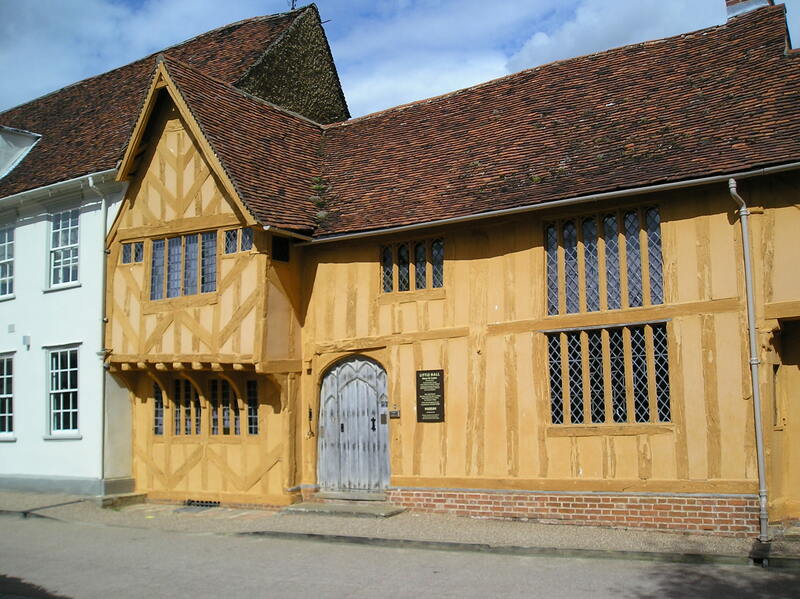 Down a side street and loooking suitably ancient; Lavenham Priory, now a youth hotel. I could not get enough of all the delightful houses and eventually took well over 300 photos. 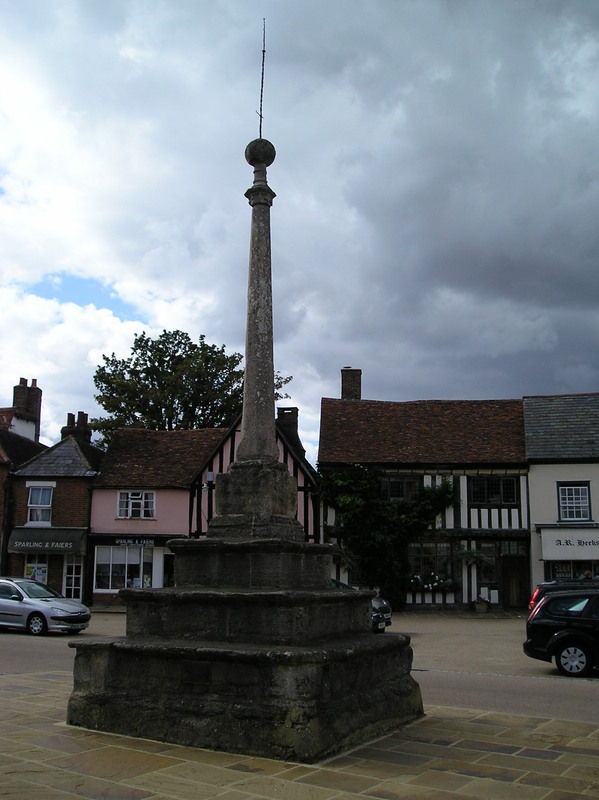 furnished with furniture of the period), and the Market Cross, erected 1501 in accordance with the will of William Jacob. 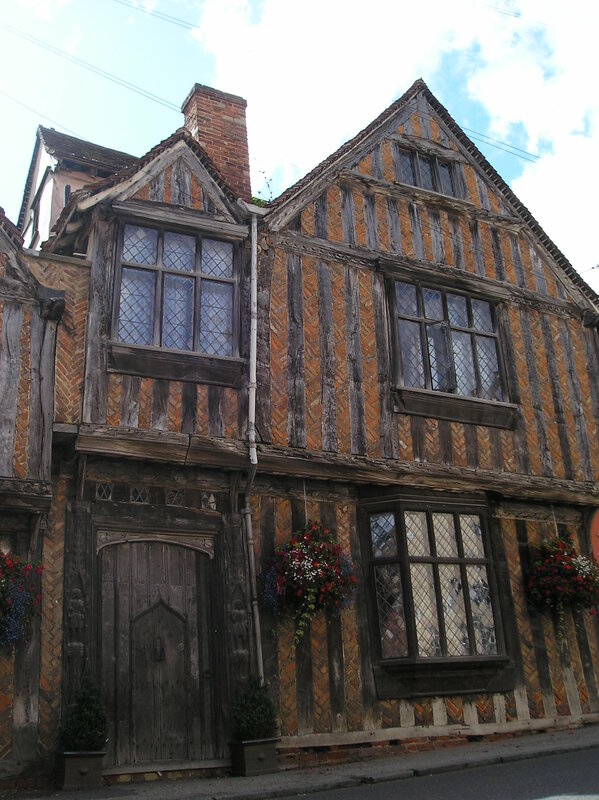 We meandered along Merchants Row a collection of Harry Potter type houses, clustered together and still in trade. 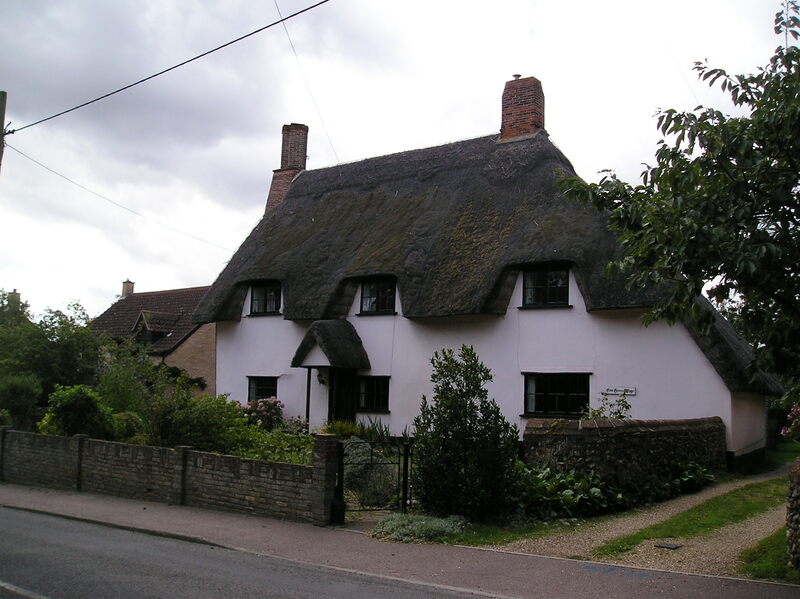 Oriel Cottage, Old Rose Cottage, Box Cottage, Buthers Cottage, The Shambles and Hare Cottage amongst others. 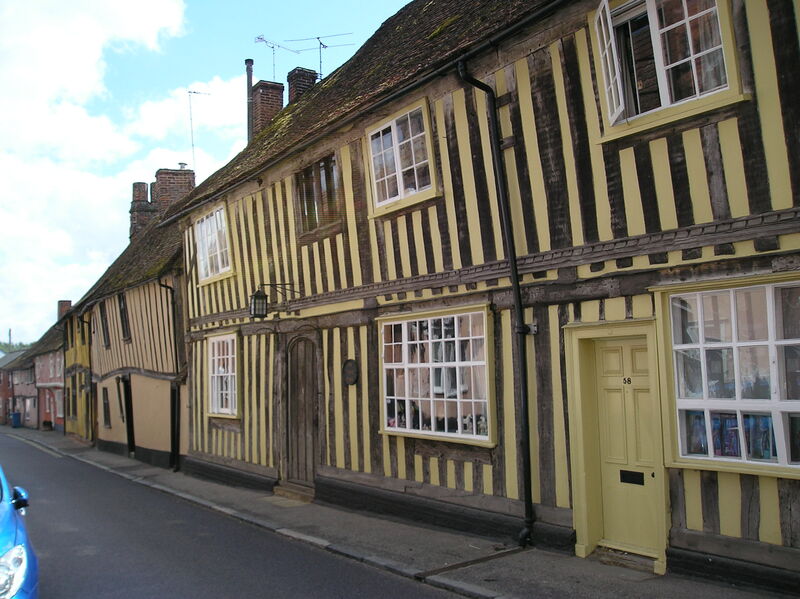 Side roads leading off the High Street are similarly lined with gorgeous houses, also gaily painted in pastel colors of green, pink, yellow and white, lopsided and ancient. 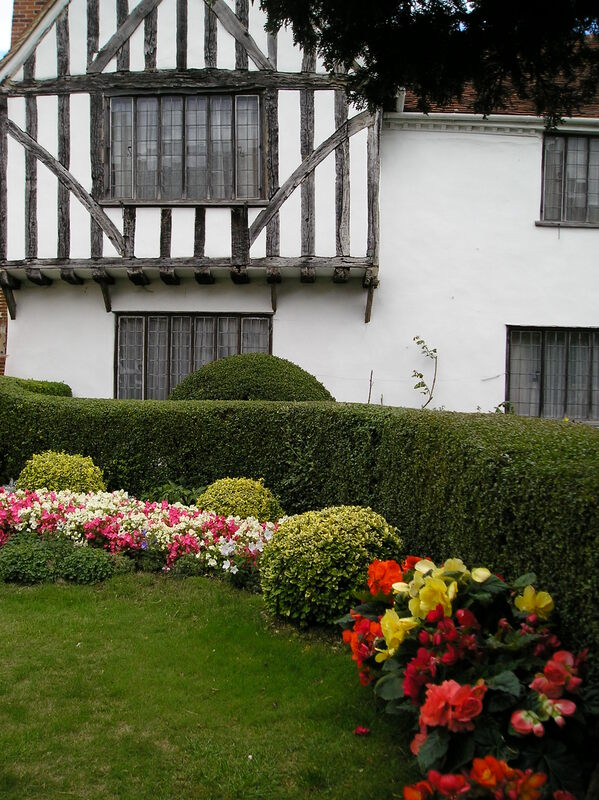 Their wooden beams, jutting out from the structure, so ancient as to be dry as bone, cracking at the edges, pretty english gardens bright with multicoloured blooms and lovely lawns; little pockets of green. 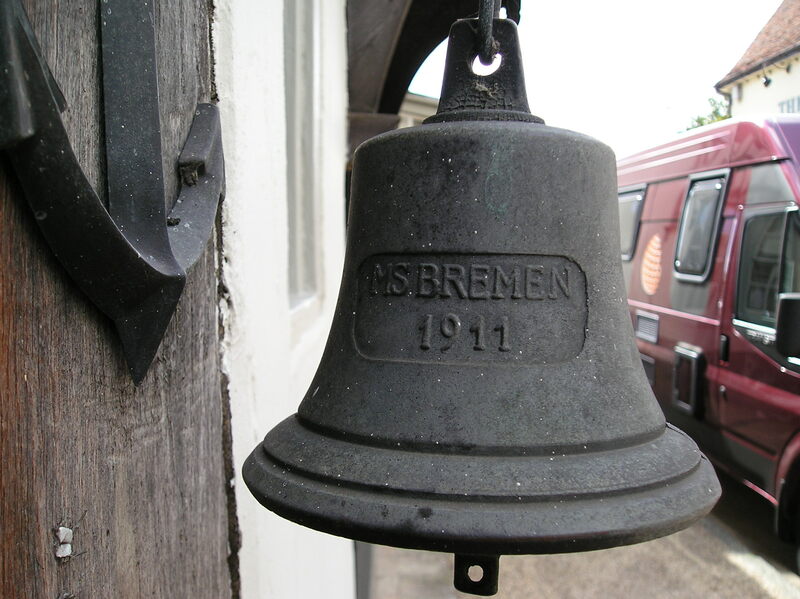 Wooden doorways, carved with marvellous creatures; angels and phoenix, grilled peepholes the prelude to our current spy-holes, old door knockers and a bell from the HMS Bremen 1911. 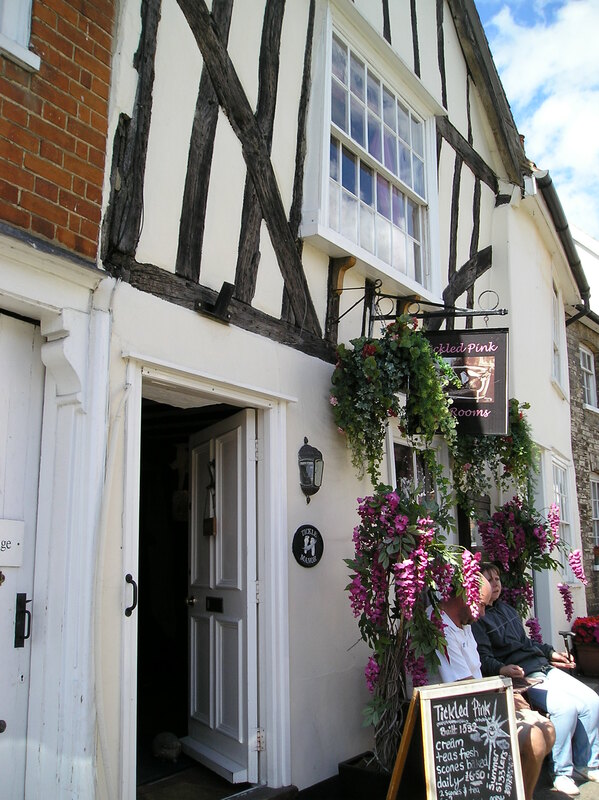 We stopped off for lunch at the twee cafe called ‘Tickled Pink’, formely Tickle Manor, with doorways so low you have bend to walk through, tiny mullioned windows, an ancient fireplace, creaky woodden floors and wooden beamed ceiling, a gorgeous jukebox in the corner. Upstairs for the view, where we enjoyed a repast of jacket potatoes with filling and salad, a very welcome pot of tea and chocolate fudge pudding dripping with thick chocolate syrup and a squirt of fresh cream; delicious. 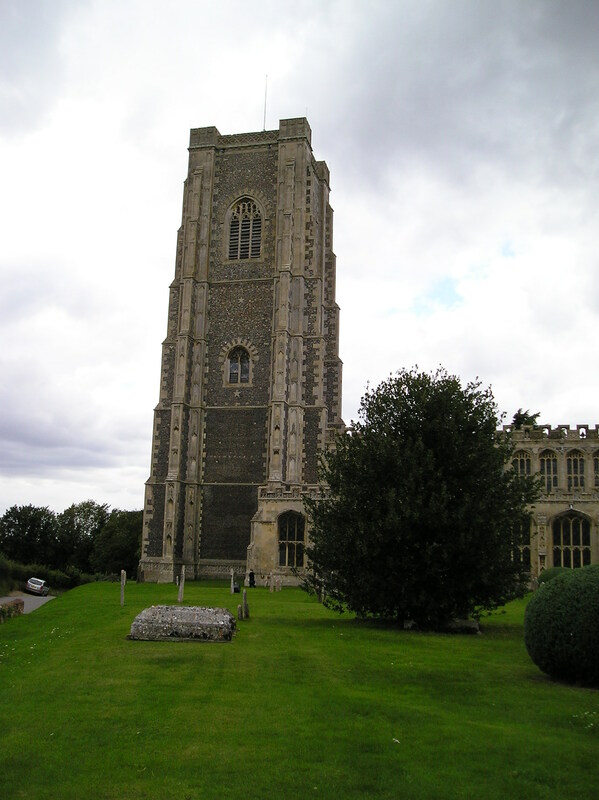 gargoyles and beautiful decorative carvings – the emblems of the Tudor Kings and Queens, finely etched into the walls; one of the finest parish churches in England. 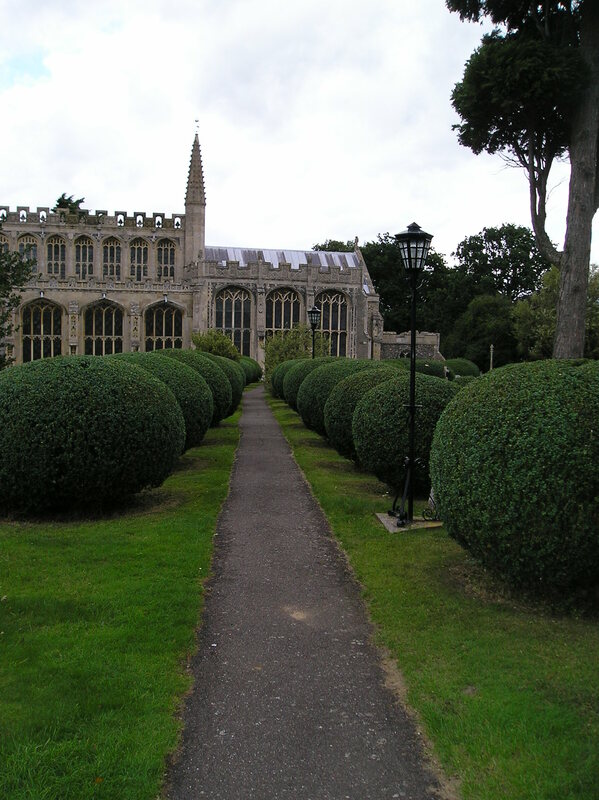 Beautifully tended, emerald green lawns, interspersed with neat paths, lined with carefully sculpted ball-shaped shrubs lead towards this beautiful, albeit imposing structure. 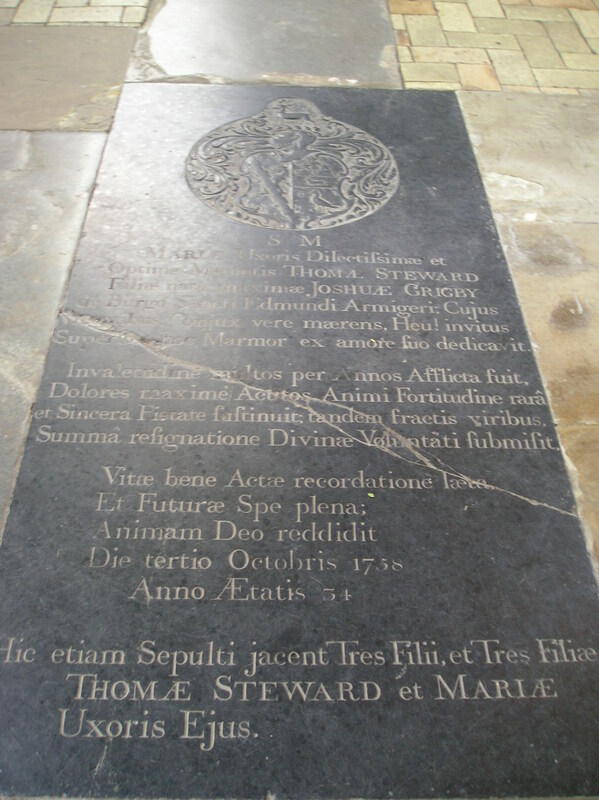 Ancient, time-worn granite slabs, their markings worn away by the passing of the ages and ravaged by the weather, dot the lawns – reminders of those long gone; now anonymous and largely forgotten. 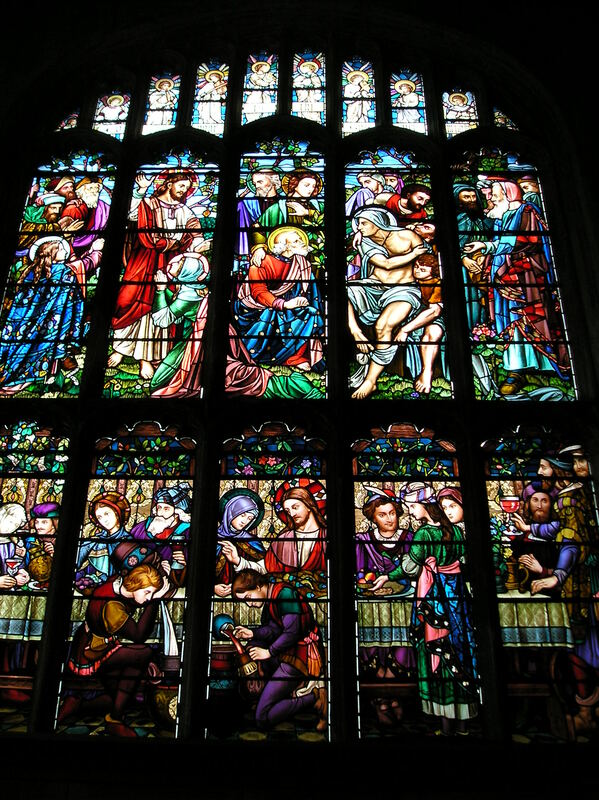 and magnificent multi-coloured, intricate stained glass windows the likes of which I have not seen before, depicting the stories of Christ and scenes from the bible; breathtaking in their colourful magnificence, dominating and demanding your attention. After drinking in our fill of the holy atmosphere we once again hopped into the car, set our course for home and handed our future over to the ubiquious tom-tom, she of the strident voice and absurdly ridiculous random directions. 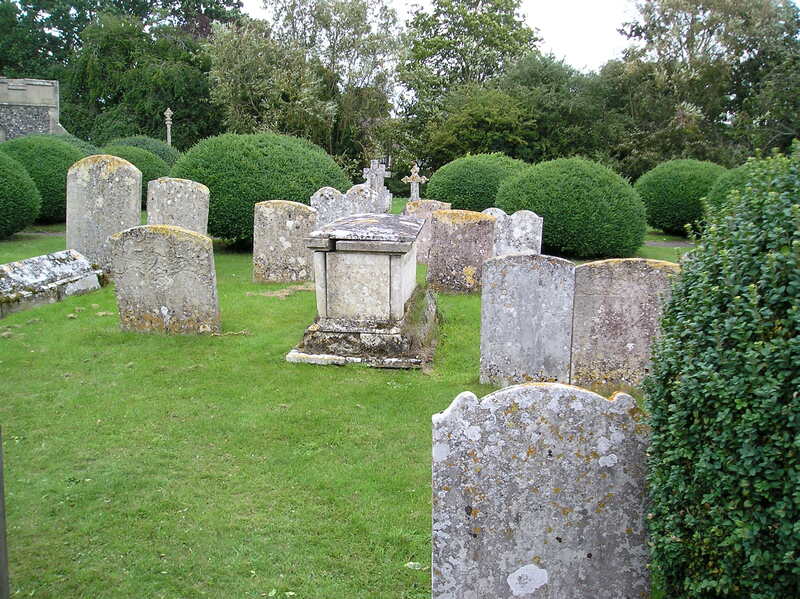 We wove in and out, round and about going along lanes narrow and winding, lined with ten foot high hedges, a dense barrier to any sort of directional guidance. By the third toneless instruction to ‘turn left at the next intersection’ I felt she was being mean and spiteful, taking us in a circle; when she suddenlyy gave us a new instruction – turn right!! Hooray. I was convinced by that stage that she was in a huff and determined to take us off into the wild blue yonder in revenge for the day’s earlier misdemeanor.